In her first best-selling book, Victoria provides a roadmap readers can follow to emulate her world-renowned dog training techniques and tame even the most problematic dog. It’s Me or the Dog: How to Have the Perfect Pet is the ultimate guide to understanding your dog and building a balanced relationship based on trust and respect. Simple, intuitive instructions and stunning color photography help dog owners not just train their pets, but understand them. When a new issue arises, owners can adjust their approach and nip the problem in the bud before it gets out of hand. 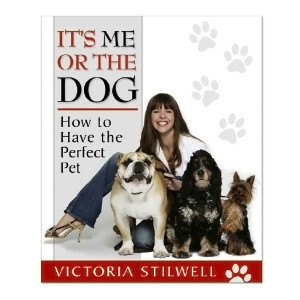 Throughout the book, Victoria reminds pet owners that training isn’t about imposing a trainer’s will on a dog—it’s about giving the dog the tools needed to live in the human world. Central to her philosophy is the idea that in order to fully understand and effectively communicate with your dog, you must first learn to talk and think dog while seeing the world from the dog’s point of view. Only then can the bond between dog and owner truly be based on constructive discipline, mutual respect, and love.